Interests - Nail art, horse riding, shopping, fundraising, animals - especially being with her dogs, working on her computer, radio 1, anything that smells or feels nice, handbags, shoes, anything girly and sparkly, Me to You grey bears, tortoises, pink poodles, card making and crafts. 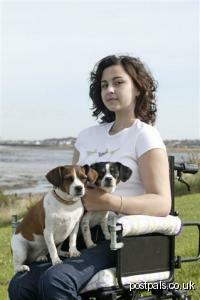 Nicole sadly passed away on the 16th of May 2010 from another brain haemorrhage. Scans only 2 weeks before showed she was still in remission from her cancer. Nicole was diagnosed with a rare type of cancer on the 8th of August in 2000, the day after she’d had an operation to remove a tumour on her spine. She was 11 years old. She had been having pain in her arm after banging it while going down a log flume in February 2000. After several trips to various doctors, she was sent to a physiotherapist who thought it might be a problem with her neck. The physiotherapist asked for an MRI scan which showed a large tumour. Nicole’s surgeon was unable to remove the entire tumour because it was wrapped around the spine, so Nicole had 8 weeks of radiotherapy. It meant travelling from Kent to London every day for 8 weeks. She had to miss the first 2 months of secondary school. Nicole then had 6 monthly scans to monitor any changes. Nicole then started getting pain in her back. In April 2002 when Nicole was 13, she had various tests including a lumbar puncture and an angiogram. Nothing showed in these tests to indicate that there was another tumour. Nicole’s cancer is so rare that she was told that it was very unlikely for it to reseed. A biopsy was necessary, so she had an operation in the July. When Nicole’s back was opened up her surgeon saw an AVM (Anterior Venous Malformation) a ball of engorged blood vessels. Nothing was done at the time because it was too risky. On December 14th 2002 Nicole was at home when she collapsed with a brain haemorrhage. She was rushed to hospital where she had tests and a scan. Nicole was unconscious at this stage. The next day she was rushed to Kings College Hospital in London where she had her operations. No one knew what was wrong with her. She had more tests and scans. She was slowly deteriorating and her vision was getting blurry. She slipped into a coma. When she woke up 5 days later (Christmas Eve) she had suffered a stroke down her right side, had bells palsy in her face and was blind. She was having fits and was put on a high dose of an anti-fit drug. Nicole couldn’t speak or move. She needed feeding tubes and was attached to drips. She then had a near fatal reaction to the anti-fit drug. Her whole body was covered in spots, her throat and lips were swollen and her mouth and tongue were covered in ulcers. Doctors still didn’t know what was wrong with her. In January 2003 another biopsy was done and doctors discovered that under the AVM was another tumour. The blood vessels were feeding off the tumour and a vessel burst which travelled to her head, causing the haemorrhage. Further scans showed what were thought to be tumours covering Nicole’s brain and spine. Nicole’s mother was told her cancer had returned, and that she needed chemotherapy. After a bit of persuasion Nicole agreed to start treatment – mainly because she could have chemo in tablet form and it wouldn’t involve needles, her biggest fear. She started chemotherapy on the 7th February, 2 days before her 14th birthday. She didn’t cope well with it. She was very sick and didn’t eat. Doctors arranged for her to go home on March 1st. A few days later a nurse told her she wouldn’t get better and only had a few months left to live. That’s when Nicole became a stubborn and determined little madam! She started to eat and began fighting back. She had 9 months of chemotherapy, finishing on 18th February 2004. She lost her straight dark hair, which was now curly! Nicole was also told she would never walk again, but Nicole was determined to prove everyone wrong! In March 2004 Nicole had a scan. Doctors then concluded what had been thought to be, the tumours in her brain were in fact infarctions – tiny little blood clots. Later that year Nicole decided to write her autobiography “The way I see it”. She wanted to share her experiences with other people. It is available now in all good book shops and on Amazon.co.uk, priced £6.99. It’s a bit of a tearjerker, so have your tissues ready when you read it! Nicole relapsed again in September 2006. She under went 6 rounds of intense chemotherapy which she finished in February 2007. She is now in remission again. Soon after she finished the chemotherapy she started to lose the hearing in her left ear. A scan showed a small tumour in each ear called an acoustic neuroma which luckily are benign. Unfortunately she has less than 10% hearing left in her left ear. She had 6 weeks of daily radiotherapy at the end of 2007, and finished in January 2008. Only time will tell if it will save her hearing in the right ear. The tumours are connected with a condition called neurofibromatosis type 2, which Nicole has symptoms of neurofibromatosis type 1. She is now having tests for NF2, but hasn’t yet been diagnosed. I have now moved on from Post Pals and would just like to say a massive thank you to everyone who took the time to send me post. You really have made a difference and I’ve made some good friends through being on the site who I’d like to keep in touch with. Just a short update before I go. Health wise I’m not great at the moment. My hearing has deteriorated quickly and I’ve now lost 95% of my hearing in my left ear and 70% in my right. Only now are people starting to take it seriously so I’m having urgent referrals for hearing tests etc. We don’t quite know at the moment what the future holds for me, and if I’m going to spend the rest of my life as deaf, blind and disabled. I will be updating my website though so you can keep up to date with how I am by reading my diary. I’ve received quite a lot of post this month. Thank you to Viks, Kate Dee, Carol and Dave, Jenn, Julie, Becky Butler, Erin F’s Nanny and Grandad, Helen F, Vicki and Susanna. Molly and Daizy didn’t win the hero dog award but we did get some good results yesterday – the latest MRI scan results show no growth. I’m still in remission and the backache is not to do with the tumours regrowing. Yay! I haven’t been feeling great this month. I’ve been getting really bad back ache and shooting pain in my hand which is the usual signs of my tumours re-growing. I’m going to have a scan on friday to get it checked. I’ve had a few infections so that could also be the cause. Fingers crossed anyway. It’s quite easy to do. Just click on the photo of Molly and it will give you our story, and then at the bottom of the page there is the button to vote. Click on that, tick the box with Molly and Daizy, enter the code and press vote. You have until the 5th February to vote, and we are going to a star studded award ceremony on the 6th February where we’ll find out if we’ve won. Fingers crossed! Thanks this month goes to Julie Barrett, Kirsty, Kira M, Helen F and a big thank you to Post Pals for the lovely card you sent to congratulate me on my book launch. I can’t believe they didn’t have any cards saying that, and it doesn’t matter it said birthday babe! It’s nearly my birthday anyway so I’m going to keep it on the side! This month is really exciting for me as my book, The Way I See It, is out. It is available now from WH Smiths, Waterstones, Asda, Boarders and Amazon. I’m having my launch party on the 10th so I’m really looking forward to it. Thank you to everyone who sent me a Christmas card, Katie, Kirsty, Julie Barrett and family, Despina. Thank you too to my ‘elf’ Susanne Miller. A massive thank you to Susanna for another lovely parcel. I really do love your parcels! I hope you liked what I sent you! Thank you also to the person who sent me the Christmas sweets and impulse set. The parcel was a bit ripped and there was no name or address on it, so I don’t know who they’re from, but thank you if you read this. I’ve now started my radiotherapy. On the 5th November I went to The Royal Marsden Hospital to have a mould made of my teeth. It was horrible and quite uncomfortable. I left with a blister on the roof of my mouth. The mould is to keep my head in the same position for every treatment. They use suction so that the mouth piece is really secure. This makes it get stuck to the roof of my mouth and the part that makes it hurt. They attach screws and metal frames etc to the mouth piece to keep it all secure, and it gets attached to the table. I was back at the Marsden on the 6th for a CT and MRI scan. I coped ok with the cannula. I took valium again, and I’ve now started having counselling for my needle phobia. Both scans were to get specialist pictures to plan the radiotherapy. They are making the rays the exact size of the tumour so it only kills the cells they want. I started my 6 weeks of daily radiotherapy on the 21st November. I’m having 30 treatments, so I’m counting the days down now. The treatment’s bearable, but it’s making me really tired. I travel 4 hours a day for 15 minutes of treatment. My date to finish is the 7th January. I went to Guy’s Hospital on the 28th to see a neurofibromatosis specialist. I was suspected to have NF1 seven years ago, but was never diagnosed because I didn’t have all the symptoms. The acoustic neuromas in my ears, which I’m having the radiotherapy for at the moment, are a sign of NF2. I had a blood test taken to do a gene test which takes three months. I’m going back to Guy’s in March, so maybe then I’ll finally be diagnosed with neurofibromatosis. I have quite a few thank you’s this month. A big thank you to Kirstie, Laura, Laura, Rebecca and Emma for the lovely envelope of very girlie sparkly cards. Thank you also to Julie Barrett, Kirsty A, Kingsley for the note and lovely picture, Louise Woodcock for my first Christmas card, Denise, Kate Dee and Post Pals as usual. I found out last week when my radiotherapy will start – the 21st November. I’m at the Marsden on the 5th and the 6th to have a mould of my teeth made and for scans to plan the treatment. They are going to make the radiotherapy rays the exact shape of the tumours so that it only kills the bad cells. The mould of my teeth is so that a bar can be connected to it and screwed onto the table so that I don’t move. I’m glad now I have a date so that I can plan things round it. I’ll keep you updated with any news. Thank you to Julie for the card and present and June Junko and Kirsty A for the card and letter. I had my scan on the 21st September at The Royal Marsden Hospital. I had to take valium to calm me for the cannula because my fear of needles has got so bad. It helped quite a bit. I was still anxious and didn’t like it, but I didn’t cry hysterically, so it was a big improvement! I had my spine, brain and inside of my ears scanned. My oncologist wanted this scan done because the one I had a month ago at my local hospital showed my brain differently to the pictures the Marsden normally take, so they were a bit worried that my cancer might have spread to my brain. I went to Scotland the next day for five days. It was really nice to get away and see friends and family for a while, and it took my mind off my results. I got my scan results yesterday, and everything is ok. When the Marsden looked at the pictures they took there’s no change to the last scan they did. It just looked different because my local hospital did it differently. My cancer hasn’t spread to my brain, and my tumours on my spine are still stable. It’s a big relief as I’ve been getting lots of headaches recently, but I’ve to just stop worrying and getting stressed now. Plus my oncologist said that he would be surprised if I didn’t get headaches with what my body has been through. As for the radiotherapy for the tumours in my ears, I’m going to speak to a radiographer next Wednesday. We aren’t going to rush into it. The tumours are benign and slow growing, so it’s ok to wait a while. There are side affects to the radiotherapy, so we have to think carefully about it. The following week I should be seeing a specialist in Neurofibromatosis to see if I can finally be diagnosed with the condition. I have symptoms of NF1 and NF2, so we’ll just wait to see what happens. I had a check-up at The Royal Marsden on Monday. I spoke to my oncologist about the tumours in my ears and how to treat them. He has recommended six weeks of daily radiotherapy starting next month. I’m going to have another scan on the 21st because something suspicious showed up on the scan from last month, so it needs to be checked. They’ll work out the radiotherapy from those results. They have to be careful not to do it in the same area as my radiotherapy seven years ago. It’s really annoying and I don’t really want more radiotherapy, but I’m glad something is being done about it to try and stop them growing and causing more damage. I saw another specialist on Wednesday at my local hospital who I was booked to see anyway before I spoke to my oncologist. The specialist said he thinks I should wait and not do anything, then have another scan in six months, and if there’s any change, then do radiotherapy. Radiation could end up causing more problems if we rush into it now. I left feeling really confused what to do, but I think I’m still going ahead with radiotherapy. If we left it I could lose more of my hearing. I only have about 20% in my left ear. If I lose the hearing in my right ear I won’t have any way of communication because I’m totally blind too. I won’t know any more about the treatment until the end of the month. I’ll keep you posted though! I’m doing quite well at the moment. I’m on antibiotics again because I keep getting urine infections, but I’m on a longer course this time so hopefully it will work. I got the results of the MRI scan yesterday to find out what’s wrong with my ear. I have an intracranial acoustic neuroma. It’s a benign tumour in each ear. They’re slow growing and half a centimetre in size. The damage that’s already been done can’t be fixed. Luckily the tumour in my right ear hasn’t affected my hearing. I’m going to see a specialist in a few weeks time, but I don’t think anything can be done though. Oh, and as usual… it’s rare! It could have something to do with neurofibromatosis, which I have parts of. I haven’t been properly diagnosed with the condition because I have parts of NF1 and NF2, so they don’t know if I have it or not. On to better results. I got my English GCSE result today. I got a B, which I’m quite pleased with. I was only 5 marks below an A though, so I’m slightly annoyed too! I’m still pleased with it though because I only went to college full time from March to June when I finished chemo and that was for one lesson a week, so I had a lot to catch up on. I’m doing much better after the last couple of urine infections. I had a great time being pampered at a spa last week, but i hurt my foot in the swimming pool, and my toenail later fell off! It’s fine now though. I have an MRI scan on the 15th to try and find out why i have hearing loss. I’ll update after that. I had a hearing test on Wednesday. I’ve been finding it hard to hear things properly for about 6 months. The test revealed I have a severe hearing loss in my left ear, and a slight loss in my right ear. I need to have an MRI scan of my ear now to have a closer look. It’s not connected to the chemo. My types of tumours grow on the end of my nerves, so it could have something to do with that. I don’t know when the scan will be, but I’m preparing myself now for the canula. I recovered after my last urine infection, but got a worse one last week, so I’m now back on antibiotics for longer. Thank you to Janice Casey for donating to my fundraising target, and to everyone who continues to send me post. I had my GCSE at the beginning of June. I think it went ok, but I have to wait now until August for the result. I had my latest scan on the 13th June. I had a kidney test too to check they’re repairing after the chemo. I had to have two canulas put in which I didn’t like, and nearly fainted with. I got the results on Monday, and my tumours haven’t grown. If anything, they’ve shrunk a tiny bit. My kidney test results were fine, and I also had an echo scan of my heart the day I got my results, and that’s getting better too. I was really pleased with those results. I don’t have another scan until December and a kidney test in a few years time. For the past 10 days I’ve had a bad headache and been vomiting. A urine test on Friday showed I have a urine infection, so I’m on antibiotics at the moment for that. I feel much better now I’m taking something for it. Thank you to Sarah for the smelly products, and for also sending some dog biscuits for Molly and Daizy. They loved them! I’ve been quite well recently. I’m back at the gym and at hydrotherapy, and I’m really enjoying it. I’m revising at the moment for my GCSE English exams on the 5th and 7th June. I can’t wait to get them out of the way. My next scan is on the 13th and I get the results on the 18th. I’m also having a kidney and heart check up on those dates. I now have a publisher for my autobiography, and it will be published in January. I am editing bits of it at the moment, and over the next few months it will go back and forward to the publishers. I’m really excited about it. Thank you as ever to Susanna in North Carolina for the brilliant parcels. I love them! Thanks also to Leoni for the letter. Last week I had a check up with my paediatrician, and an ultra sound of the blood clot. It’s still there from my lower stomach to my knee. Today I saw a specialist at a haemophilia clinic. He reassured me a lot about the clot. It will go away in time, and won’t move. I have to keep having the anti-clotting injections. It was number 143 today. I’m coping ok with them. I’ve been told its ok to start exercising now, and going back to the gym. I plan to go on the 8th May. This weekend I’m doing a sponsored walk (details on my website) and I plan to walk a few steps at the beginning and end. Mum will push me the rest of the way. I’m feeling much better. Almost back to normal I think. My hair is growing quickly, and my eyelashes are really long. People keep saying I look like Sinead O’Connor. I’ve been feeling better over the last few weeks. My leg is almost back to its normal size, and there is hardly any pain. I still panic sometimes that it’s getting bigger, and ask Mum to check if my leg has turned blue. I had a blood test last week (nightmare now that the hickman line has gone) and the porter at the hospital didn’t pick my blood up until the next day and the lab said it was too old and refused to work on it. I wasn’t happy! I have a blood test next week, so i will be making sure the blood gets there! I have an ultrasound of my leg booked for the 19th April. That will check if the clot is disappearing. I am still having the daily anti-clotting injections. I’ve had 118 now! I started doing physio again yesterday. I walked a few steps with my walking frame. I’m trying to build my strength up for my sponsored walk on the 28th April. It is a 5 and a half mile walk and i want to walk a few steps at the beginning and again at the end. I am hoping to start back at the gym after Easter. My nails are really horrible. They’ve broken off and are really short. Good news though is that my hair is really stubbly now! Thank you to Post Pals for my lovely Marsden t-shirt and I hope everyone has a great Easter. I had my scan results this afternoon. My tumours have stayed stable. They might have even shrunk a little bit. My next scan is in June. My oncologist has stopped a few of my tablets too, which i’m pleased about. I had the bandage changed on the cut where my line used to be. It’s healing nicely and doesn’t hurt. I went into my local hospital on the 19th of February with a large blood clot in my leg. It was absolute agony. It was from my hip to my knee. I had x-rays, ultrasounds, scans, and blood tests, to find out how to deal with it. It was quite confusing because I’ve been on anti-clotting injections everyday for 3 months to prevent another clot after I had one in my arm in December. I am now on a new higher dose of injection. I spent over 2 weeks in hospital, and only got out yesterday. I kept catching line infections which kept me in for longer. I got totally fed up as there is nothing to do there. After I had grown the third bug in my line, they started me on a new antibiotic. Half an hour after having it by drip, I started scratching and coming out in spots. I now have to put that name on my medic alert bracelet. I went to The Marsden today. I had an MRI scan. I’ll get the results of that on the 12th. They decided while I was there that they will take my hickman line out tomorrow afternoon, because it keeps getting infected. Hopefully that means no more trips to my local hospital for IV antibiotics. I will update next week with my scan results. I finished my final round of chemo yesterday. Woohoo! I had a much lower dose because my heart scan results were borderline. My kidney has improved since the last test though. I am on anti-biotics at the moment because my line is infected. Mum has to put a special bandage on everyday. My next MRI scan is on the 7th March. I get the results on the 12th. I need a kidney test and echo scan every 3 months for the next couple of years. Thank you so much to everyone who sent me birthday cards and presents. Thank you to Nicole B, Laura H, Leoni, Julie Barrett, Kate Dee, Hayley for the brilliant badge, Heather and everyone else. I’ve had my 5th round of chemo in the last month. A couple of weeks ago I got a bad virus and spent a while in hospital. I felt awful, and needed another blood transfusion. I should have had my final round of chemo last week, but we delayed it for 2 weeks, until after my birthday. If I had had it last week like planned, I probably would have been ill on Friday for my birthday. I will start it on Monday, and finish on Thursday. Thank you to everyone who continues to send me post. I had a blood test taken yesterday, and it revealed my platelets are really low. Normally that would be ok, but because I’m on anti-clotting injections, and platelets are what clot your blood and I don’t have many, they said I need a platelet transfusion. I’ve never had one of these before. I need to go to hospital tomorrow morning to have a blood test, and if that shows that my platelets are up enough I might be able to come home. If not I need to wait and have the transfusion. It takes about 5 hours before they arrive, but only about an hour for the transfusion. I could be starting my year in hospital. I finished my forth round of chemo on Thursday. It ran quite smoothly. I have an infection in my line which needs IV antibiotics. They finish tomorrow. A nurse is coming to our house to do it which is good. Otherwise Mum would have to drive 45 minutes to hospital, for a 2 minute job. I got my scan results while we were there, and my tumours have stayed the same size as before my treatment. It means the chemo is working. I only need 2 more rounds of chemo. My specialist said that will be enough. I’ll have another scan after that, and then my hickman line out a few months after that. I will be scanned every 6 months for a while. The injections are going well, if that’s what I can say. I’ve had 21 now, and counting! Thank you to all the people who have sent me Christmas cards and presents. To Natalie for the lovely bracelet, Colette for the tape, Kate Dee, Aled G, Faye T, my lovely ‘elves’ Carol and her Mum, and anyone I’ve forgotten. There’s been so much this month. I do appreciate it all. It has been a bit of a rough week. I had my third round of chemotherapy last week, starting Monday. I had a lower dose than the previous rounds because the kidney test I had the week before showed that one of the chemo drugs had damaged one of the vessels to the kidney. It can be repaired with time, and hopefully by the next round of chemo so that I can have high dose again. Things went smoothly until Wednesday when my Hb came back at 8.2. It should have been much higher at that stage of my treatment. That meant the blood transfusion I thought I had got out of the week before, I had to have. It was a 6 hourly one overnight, so I was less aware of this one. My chemo finished at 5pm on Thursday, and transport was supposed to pick us up then. My right arm started hurting almost instantly after being disconnected from the drips. Transport finally picked us up at 7pm, so by this point I was quite stressed because I just wanted to get home. We finally did at 9.30pm after being on an uncomfortable minibus with other patients, dropping them off along the way. My arm was agony by this point. When Mum looked at it in the light, it was a funny blue colour. I could hardly move it. My veins were sticking up, and my arm was fatter than the other. Mum phoned the nurses and they said it could be a clot and I had to go straight to The William Harvey hospital. I couldn’t believe it, but then again, I could. So yet again I was having a chest x-ray at 1.30am. I had blood taken too and the results showed a thrombosis. They said they needed to give me an injection in my stomach. Not something I wanted done at 4am. It stung a little bit. Friday my arm still hurt as bad. I had an ultrasound, which revealed there wasn’t a thrombosis, even though my blood said there was. I also had an ECG, but those results didn’t show much. I had another injection on Friday and Saturday in my stomach. I was also started on warfrin. Doctors couldn’t find the clot, but most of the tests revealed there was one there, so they were treating me for one. On Sunday the injections stopped and my arm was much better. I was supposed to have an MRV scan on Monday, but the hospital couldn’t do it because they needed a specialist, so I have to go somewhere else for one. There was blood in my urine too, so that was quite frightening. They said they had to get the balance right with the warfrin. A few hours later they said they had to stop it because it can be quite dangerous and I’m on lots of other drugs, and start the injections again, and I would probably need them every day for 3 months. I have a total needle phobia, so this was the worst news ever for me. I prepared myself for hours for them to start, but then I was told I didn’t need one that day, and that they would give me some vitamin K and they let me come home. The injections started yesterday. I’m coping with them better than I thought I would. I still don’t like them though. My MRI scan is booked for Monday 11th December. Keep your fingers crossed for me. Thank you to Collette, Julie Barratt, Nicole and Lauren B, Dispena. I spent this week in my local hospital. I had a very high temperature on Saturday night. I felt really rough over the weekend, but the doctors couldn’t find out what was causing the temperatures. All the tests were coming back negative. I picked up on Tuesday and my temperature stayed down. Thursday morning I was told I could go home, but then my blood results came back and revealed my Hb was 7.9. I was due to go to The Royal Brompton during the day for an echo scan, so a blood transfusion was scheduled for when I got home. The echo results were good and I’ve gone from being borderline 28% to 34% and I can have high dose chemo again. When we got back from the Brompton, they said there was a problem with the blood sample they sent off and the blood wasn’t ready. I had to have another sample taken and wait for the results. When they came back my Hb had gone up to 8.7 and I was allowed to go home without a transfusion. I had a kidney test and ultrasound on Friday at The Royal Marsden. I’m back there tomorrow for my third round of chemo. I will be scanned after this round. I haven’t got a date for that. Thank you for all the post people have been sending. Thank you to Bob, Chloe and Kelly. I’ve had a bit of a rough time this last week. Things were going really well, and I felt fine until last Thursday. I had a really high temperature, so had to go to hospital. I had an infected hickman line, and it was agony around the place where the line goes in. It hurt every time I moved. I got totally fed up in hospital. My hair began to matt, and it was really sore and itchy. Mum had to cut it in the end, and practically all of it has fallen out now. I have a wig though, luckily. On Monday I had a blood transfusion. I didn’t want one, but it made me feel better. Someone had to bring a hat for me for coming out of hospital on Tuesday night. I went in with a full head of hair, and came out with none! I finished the antibiotics yesterday. I was supposed to start my 2nd round of chemo today, but that has been postponed. I need to have an EDTA scan tomorrow, then an echo scan on Monday. I might be staying in hospital then for the chemo. Thank you so much to everyone who has sent me cards and presents to cheer me up. They really have done the trick. Thank you Susanna for your amazing parcels, and giving me something I’ve wanted since I was a kid, my own monkey! Kate Dee for continuing to send me cards and for the gorgeous grey bear, Nicole B for the cute Eeyore and for putting lots of thought into my card, Sylvi, Becky, Julie Barratt, Kate Post Pals for the earrings, Viks for chemo duck (cutest thing ever!) Karen, Kelly, Christina, Alex and a huge thanks to the sparkling strawberry company for the box of 7 pink wigs and cowboy hat! Nicole has been in hospital in Ashford since Thursday evening with a high temperature and an infection, but she should be home tomorrow. I got out of hospital on Sunday. There has been no side affects yet apart from tiredness. Thank you for chemo duck, everyone was impressed with him at the hospital. I will take a photo of me with him soon and send it to you. I will be on City Hospital this Friday, BBC1 between 10-11am. Fingers crossed that i’m well enough though! I’m staying in London the night before. If they want me then they have to pay for me so they are putting us up in a hotel! Please can you let people know that would like to see me on the show. I had an echo scan on Monday to check my heart could handle high chemo, and luckily it can. I am having my hickman line in tomorrow and start chemo on Friday. It is a 22 hour infusion, so it’s going to be quite boring. I’m not looking forward to the hickman line being put in. I’m scheduled to have it done at 3pm. I got my full scan results on the 24th. Mum found out on the 22nd, but i was having a weekend away so she didn’t want to spoil it and told me when i got back. Both my tumours have started growing back. I went to the Marsden the next day to see my specialist and he wants to start treatment in a few weeks time. I will have a hickman line so i won’t be pricked with needles all the time. I will start with 3 courses, and then i’ll be scanned after that to see if it’s working. I was a bit upset at first, but i’m doing ok now. I’ve done it before so i’ll do it again. I start my chemo on the 12th of October. The line is going in the day before. I’m not really looking forward to that. I’ll keep you all posted with any news. Thank you Susanna for the great box of presents and for putting so much thought in to it. Thank you also Julie Barratt, Kate Dee and Despina. I had my scan on the 19th, and my doctor had a quick look at the results. He said that it looks ok, but he is going to compare to the rest of my scan results from the last few years. I’ll get the full results next week. Nicole has had a lot of backache since the last update. She has been feeling a bit run down and headachy. She is seeing her doctor on the 5th of September. She is going to ask for a scan as she is getting pain in her arm again too. Her back has been hurting more than ever this month, and she just can’t get comfortable in her wheelchair. Painkillers don’t seem to help. She had a trip to Harrods a few weeks ago, and loved it. Shopping’s what she does best! She is going to Scotland for a week to have a break. She is really looking forward to it. She has family who live there, and is meeting up with the agent who is helping with her book. It’s been a busy month for post. Nicole would like to thank Julie Barrett and Kate Dee as usual, Susanna, Jen, Nicole and Lauren B, Marry Anne, Eleanor and the person who sent the poem and little balloon thing. You didn’t leave a name, but thank you. Nicole had a few days this month where she didn’t feel well. Her chest felt a bit tight, and she had a headache. It was probably down to the weather as she doesn’t cope too well in the heat. Her back has nearly recovered from the fall, but she still gets painful spasms now and again. It will just take time to heal. Apart from that she is fine. She used crutches this week at the gym which she loved. She said it was harder work than she thought. She will continue her physio, hydro and gym work in the summer holidays. She has broken up from school now. She starts college in September. At the moment Nicole is trying to think of fundraising events to reach her target of raising £30,000 for The Silver Lining Appeal. If you have any ideas, or are able to donate anything please visit her website. Nicole would like to thank Julie Barrett for her continued support in sending gifts and cards, and for the lovely box she made. Nicole didn’t have too good a month last month. On the 5th of June she fell off her horse, Sox, after she got spooked by some children messing around in a bush. Sox jumped and tried to gallop off and Nicole fell back flat on her back. She was dazed and confused for a bit, and couldn’t remember what had happened at first. Her head was thumping, and she couldn’t feel her back, so an ambulance was called, and she was strapped onto a board and taken to hospital. Nicole spent the rest of the day there. She had a CT scan, but everything was fine and Nicole was given a week’s bed rest. She was due to do a competition on the 8th of June at Hickstead, which she was really looking forward to. Missing that upset her the most. Her back was really sore, and Nicole was unable to do anything properly for a long time. She has since been back to horse riding. She is still getting twinges in her back; it’s something she didn’t get before. She is going to visit her doctor again to see how to treat it. Still no news on the scoliosis front! Nicole would like to thank everyone who has written to her, and sent gifts. Thank you to Kate Dee, Julie and Alan Barrett, Becky Butler, Katie and everyone else. Nicole has been really well recently (although she did fall off her horse). She is still waiting to hear about how her scoliosis is going to be treated. Her back is aching a lot which means she can’t spend a long time in her wheelchair, but she did manage to go to see Take That in concert last week. She left in the afternoon and didn’t get back until early morning! She had a brilliant time though. Thank you to Claire for getting in touch with Post Pals and giving her the tickets. Thank you also to Becky Butler, Julie Barrett, Caroline Wood, Kat for the lovely monkey thing [she loves monkeys], Kate Dee for the pampering set, Kate and Post Pals for the lovely cards with encouraging messages, and the personalised grey bear card. She loves grey bears. Nicole was diagnosed with scoliosis in March. She is waiting to see a specialist to see how to treat it. It explains why she has been getting bad backache. Apart from that, she is doing really well. She is improving in her walking. She can now walk 15 steps unaided in the hydrotherapy pool and has been on City Hospital (on the BBC). Nicole would like to thank the people who have sent her things through Post Pals. It really does cheer her up. Thank you to Julie Barrett for the fudge and mini eggs and to Becky for the murder mystery tape. Thank you to Nicky W, Becky Buttler and Cherry for the letters and emails. I love receiving emails because my laptop reads them to me and I can reply to them. Thank you for all the cards, especially to Kate Dee for the 3D cards that I can feel.